A Boeing Delta 2 rocket launched skyward from pad 17B at Cape Canveral Air Force Station in Florida today at 1:47:08 p.m. EST (1847:08 GMT). This story was updated at 6:55 p.m. EST. A NASA probe carried into space earlier today by a Boeing Delta 2 rocket has deployed its mission-critical solar array, though engineers are working to understand a glitch that pushed the spacecraft into a fault-protection mode just after launch. The spacecraft, Deep Impact, apparently entered a "safe-mode" - a condition normally used in the event of a problem - after launch, but is healthy, agency spokeswoman Natalie Godwin told SPACE.com. The $330-million Deep Impact mission launched today at 1:47:08 p.m. EST (1847:08 GMT), after favorable weather conditions and a relatively smooth countdown allowed an on-time liftoff from Launch Pad 17B. Nine strap-on solid rocket boosters aided Delta 2's space shot. "We did have a perfect launch actually," said NASA launch manager Omar Baez just after liftoff. But it was after the launch, while Deep Impact was on its own, that a glitch - mostly likely caused by a too-low temperature limit in propulsion system heaters - triggered the fault-protection mode, which mission engineers hope to fix in the next 24 hours, according to SpaceFlightNow reports. Ground controllers initially experienced difficulty confirming solar panel deployment, but later confirmed that Deep Impact unfurled its solar array, used to generate power during spaceflight, then turned them toward the Sun using onboard thrusters as planned, NASA officials said. There were also some minor prelaunch concerns, but all were overcome by launch time, Baez said. Those concerns included high-level winds early in the day, the loss of a critical radar to track Deep Impact's liftoff (which returned before launch), as well as the loss of second stage telemetry during an engine burn to leave Earth orbit, NASA officials said. About 35 minutes into the flight, at 2:21 p.m. EST (1921 GMT), Deep Impact successfully separated from its third-stage booster and as it flew over South Africa. NASA's Jet Propulsion Laboratory (JPL) in Pasadena, California is managing Deep Impact's comet- bound spaceflight. Deep Impact is actually a composite of two vehicles: a Flyby mothership designed to observe Tempel 1 from a distance while the spring-loaded Impactor probe carves a chunk out of comet during a July 4 rendezvous set to occur 83 million miles (about 133 million kilometers) from Earth. "The real goal of Deep Impact is to understand how the interior of a comet is different from its surface," said University of Maryland astronomer Michael A'Hearn, the mission's principal investigator, an hour before launch. "We want to excavate as deep a hole as we can to get down to the primitive material." While the actual impact with Tempel 1 is expected to occur while both Tempel 1 and the Deep Impact probes are 83 million miles away from Earth, the NASA spacecraft will traverse about 268 million miles (431 million kilometers) in the six months - quite brief for a deep space mission - it will spend flying toward its cometary target. "It's exciting, but it's a fast mission from launch to encounter," Don Yeomans, a senior research scientist with the Deep Impact mission at JPL, told SPACE.com. "We don't have a great deal of time to calibrate the instruments." 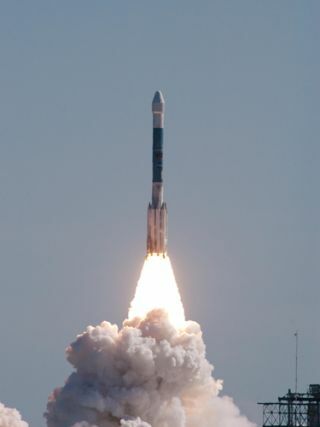 Today's launch marked the first space shot by NASA - or anyone else for that matter - for 2005.